- 2 pieces of hard plastic grid. The type I use is “egg crate” styrene, which is sold in 2’ X 4’ panels as a lighting diffuser for fluorescent ceiling lights. It is available in most hardware stores for $20 or less. 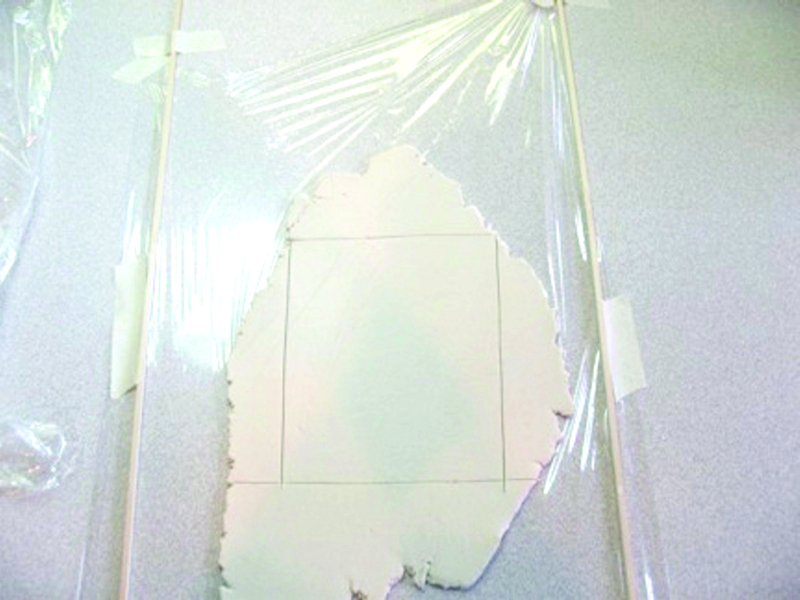 The sheet can easily be trimmed to more manageable sizes with flush-cut nippers or a saw. I generally cut mine into thirds, which gives me three pieces approximately 15” X 24” (some length is lost when snipping off the sections in between strips). Two sections are needed for each flat sheet of clay you intend to make, so you may wish to cut one of the 15” X 24” sections in half to use for small sheets. - 2 wood strips in the thickness you want your finished paperclay sheet to be (I'm using 1/8" square strips in the example). 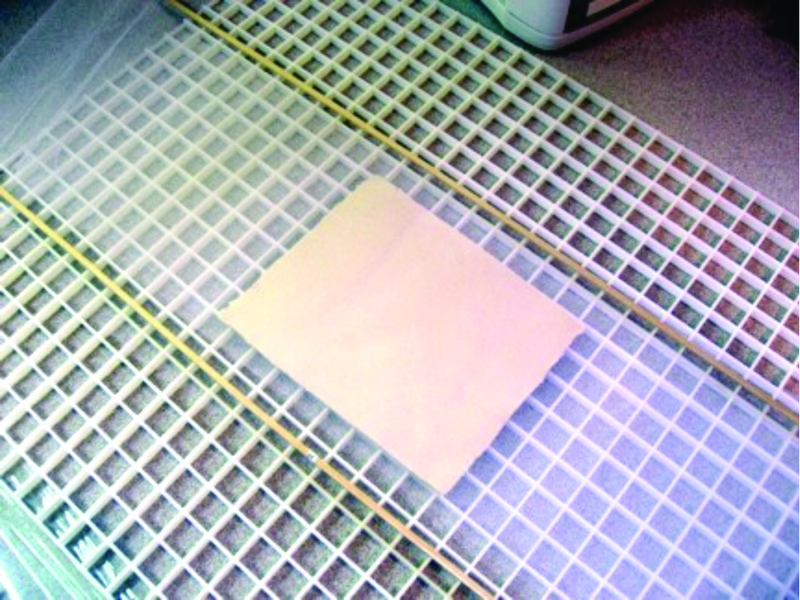 The clay sheet will be slightly thinner than the strips, since it shrinks a small amount while drying. 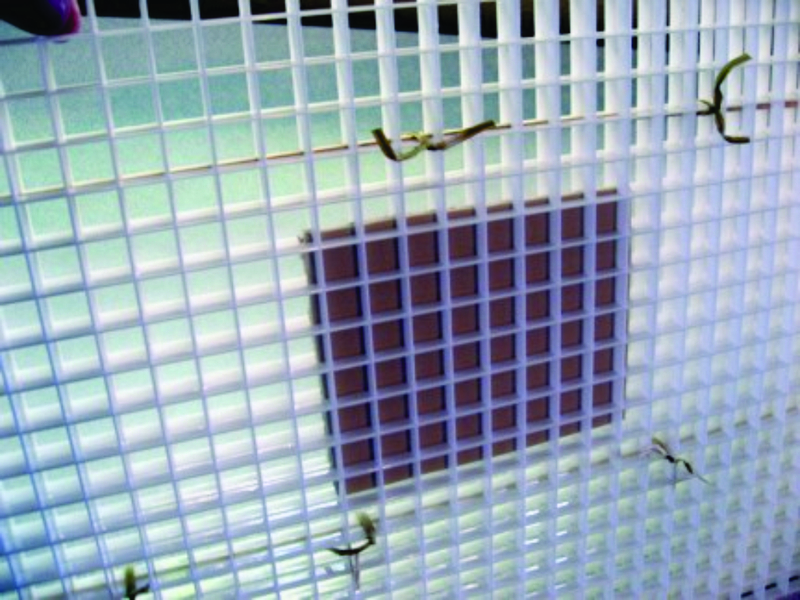 - 2 pieces of screen fabric (the nylon type used for screen doors and windows) or, thin fabric strips. The purpose of the fabric is to avoid grid marks in the clay - Just about any fabric will work, as long as it is made of a material that will allow air to get to the clay, and will allow you to put wires through it easily. - 4 to 10 lengths of wire about 5” long. The number you need will depend on the size of the clay sheet you roll out. Look ahead at the photos and you will have a better indication of how these are to be used. 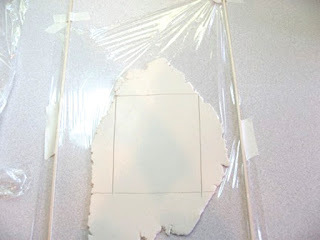 - Tape a piece of plastic wrap to your work surface, then tape the wood strips on either side of it - make sure that the strips are not spaced farther apart than the width of your rolling pin. 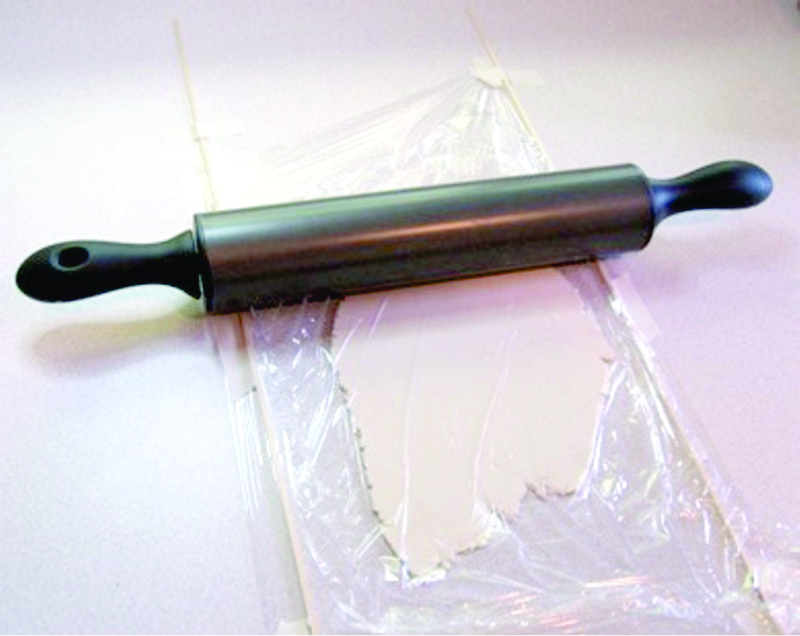 If you are using thin wood strips, also tape along the sides so the strips don't spread out under the pressure of the rolling pin. 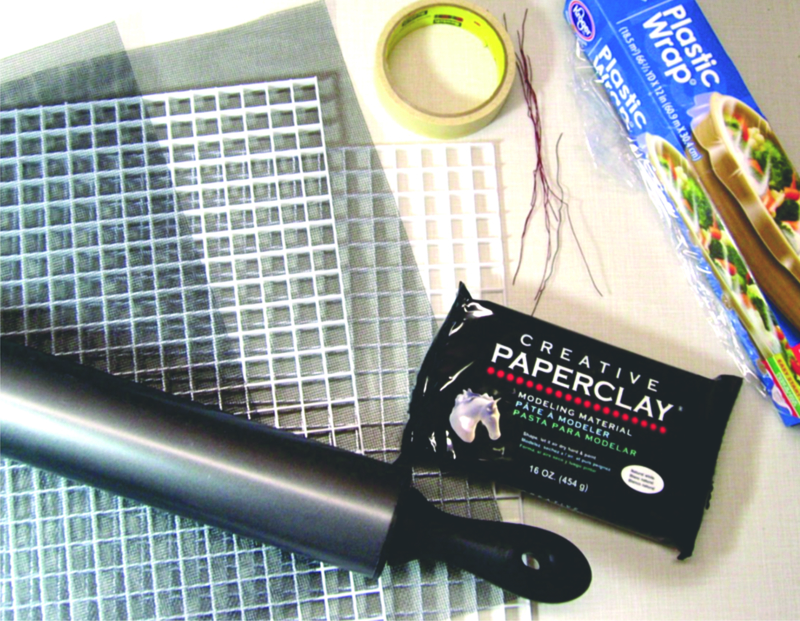 Put a lump of clay on the plastic wrap, lay another sheet of plastic wrap over that, and start rolling. Lift and turn the clay occasionally to avoid it sticking to the wrap. Use caution when turning the clay though – lift and flip quickly to avoid letting the weight of the rolled clay stretch the sheet. Or you may lift one edge and roll it onto the rolling pin, as is done with pie dough. 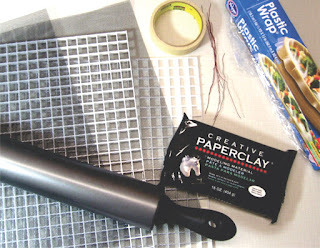 Continue rolling out the clay until your rolling pin is flush with the wood strips (the clay isn't getting any thinner; the rolling pin is riding along the wood strips). Place one piece of screen on one of the plastic grids, then carefully lay your clay sheet on top. Place a second piece of fabric on top of the clay. Un-tape the wood strips from your work surface and place them on either side of the clay. (I’m using white tulle for the photos because the dark nylon screen didn’t show the process very well). 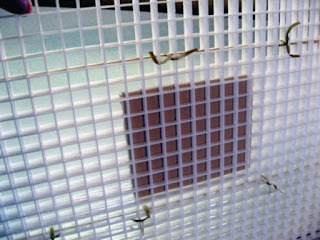 Now place the second piece of screen and the second plastic grid section over all of this, so you have a "sandwich" of screen, wood & paperclay, between the two plastic grids. Secure the sandwich together by putting a wire tie through one of the sections on the grid, close to one side of a wood strip, through all the layers, then back up through the bottom piece of grid on the opposite side of the wood strip. Attach as many ties as necessary to hold the grids securely. Set aside until paperclay is dry. 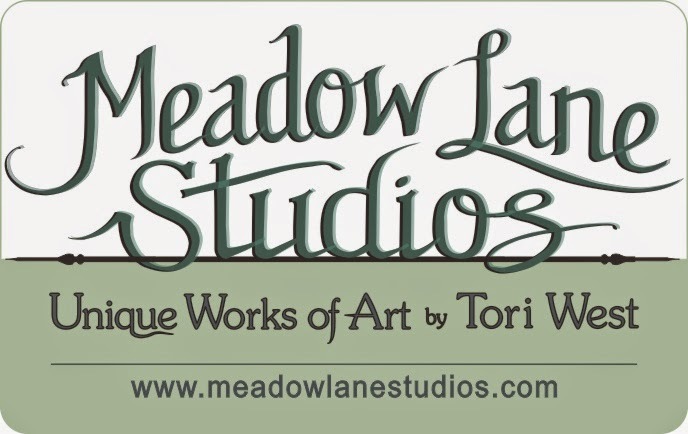 Please let me know if you have questions or comments about this process! 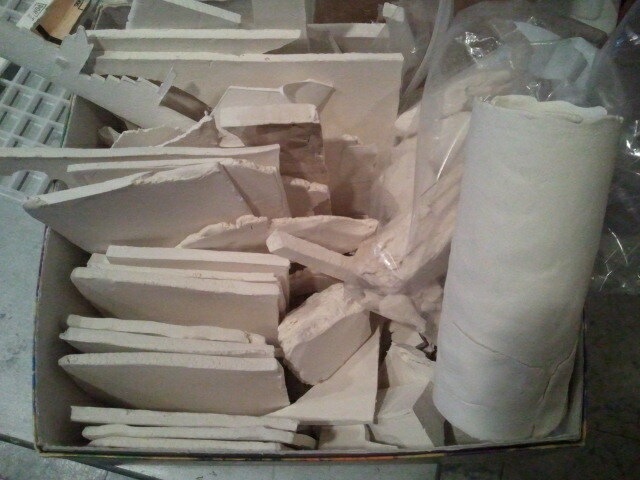 Here's is a peak at some of my dry paper clay stash :) I should probably store it flat to keep it flat, but I just put the sheet scraps in a box after I've used them for a project. As you can tell, I have many different shapes and thicknesses saved up.